Herbicide Potion is the 3rd potion you will learn in year one - chapter seven in Harry Potter: Hogwarts Mystery mobile game from the most known Potion Master, professor Severus Snape. 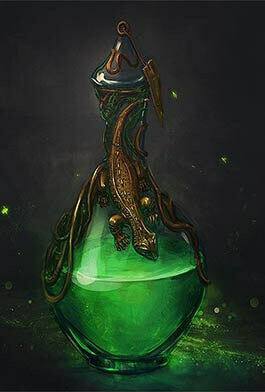 As the name suggests - Herbicide, this potion has something to do with Herbs. In this case, Herbicide Potion has everything but love for plants. Herbs or plants are used to give all kinds of flavor and aroma for meals. They can also be used as an important ingredient for medical purposes or for making some magic potions. So, this potion isn’t meant to be around plants. If you pour this potion on plants it will kill them or at least damage them. If only we had this potion when the Devil’s Snare attacked us…Also, if you are wondering, no, this potion isn’t drinkable. In order to learn your 3rd potion in your freshman year, you will need to earn 5 stars. Earning stars process will be a series of tasks which will need energy as fuel. It is recommended to start this lesson with a full energy bar. If you still don't have enough energy to finish the rest of your lesson, you can find some energy hidden in objects all around the classroom and in the castle of Hogwarts. First, Professor Snape will demonstrate his potion skills. He will show you how to properly prepare the ingredients and, of course, warn you about the consequences of failing to do everything right. You will have to do this until you get your first star. For your first task, you will need to find the ingredient called Lionfish Spines. Finding and preparing the bowl for crushing will earn you one more star. When you finish everything, you will be given the movement path to commence crushing that will look like an upside letter "U". Next task will be to find and add the ingredient called Flobberworm Mucus. When you've done everything, like with the previous ingredient, you will be given the movement path on the screen for adding your substance. Finishing this will award you your 3rd star. When all of your ingredients are in the cauldron you will need to stir it so all of your elements mix, also, stirring will prevent your elixir from burning up. This process will earn you your 4th star. Now, all that is left is for you to finish your potion by moving your finger on the screen in the right way and your concoction will be completed. Completing Herbicide Potion will grant you +5 Gems that you can spend on many features that Harry Potter: Hogwarts Mystery mobile game provides.